The global market for pharmacy benefit management was estimated at US$ 405.4 billion in 2017 and expected to grow at a compound annual growth rate (CAGR) of 5.4 percent over the forecast period from 2018 to 2026. 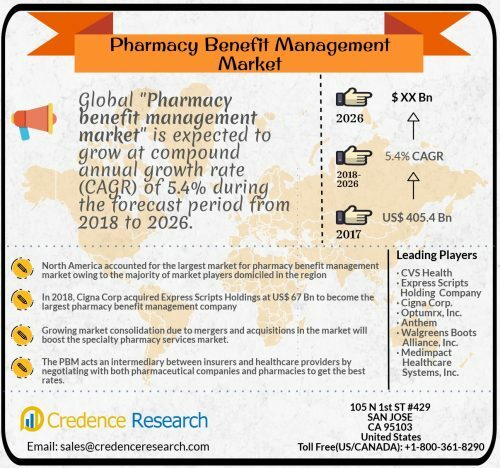 SANJOSE, United States - March 20, 2019 /MarketersMedia/ — The latest market report published by Credence Research, Inc. “Pharmacy Benefit Management Market - Growth, Future Prospects, Competitive Analysis, 2018 - 2026,” the global pharmacy benefit management market was valued at US$ 405.4 Bn in 2017 and expected to grow at compound annual growth rate (CAGR) of 5.4% during the forecast period from 2018 to 2026. The global pharmacy benefit management market is projected to grow at a steady rate during the forecast period. The pharmacy benefit management reduce cost of prescription drugs and increase safety and convenience for consumers, government, unions, pharmaceutical companies and pharmacies. PBMs are playing a significant role in the establishment of swift access of pharmaceutical products to patients at a lower rate, acting as the major driver for the growth of the market. Mergers and acquisition in the market are leading to vertical integration driving the market. Partnerships between PBMs and health insurance companies have dramatically changed the dynamics of the market. In 2018, Cigna Corp acquired Express Scripts Holdings at US$ 67 Bn to become the largest pharmacy benefit management company. It was followed by CVS Health acquiring Aetna, Inc. The major reason for alliance with insurance companies includes personalized and affordable healthcare plans for the patients and improved co-ordination with healthcare professionals. In terms of geography, North America accounted for the largest market for pharmacy benefit management market owing to the majority of market players domiciled in the region. Highly organized insurance sector and healthcare policies in the region makes the market most lucrative. Moreover, presence of major pharmaceutical companies in the North America and major dependency of these companies on PBMs for better access in the market will drive the demand for pharmacy benefit management services. Emerging economies will experience fastest growth rate during the forecast period owing to developing healthcare infrastructure. The pharmacy benefit management companies have huge opportunities in these market owing to high target population, unorganized price and insurance structure making it highly attractive market to invest. The key players currently engaged in pharmacy benefit management market include CVS Health, Express Scripts Holding Company, Cigna, Anthem, Optumrx, Inc., Walgreens Boots Alliance, Inc., and Rite Aid Corp. among others. 7.6. Walgreens Boots Alliance, Inc.
7.7. Medimpact Healthcare Systems, Inc.